The ADAC “3-Städte-Rallye” (23.10.2010) with start and finish in the easter-bavarian town of Kirchham, brought the “I-dot” to the ADAC Rallye Masters 2010. A perfect organisation, wonderful special stages and a great ambience in the rally centre “Haslinger Hof”. During the nine rally competitions over whole Germany the Tyczka Totalgaz Subaru surprised with good results and was long time on course for the podium. Unfortunately brought a breakdown on the first final-run the project around the deserving success. Nevertheless we struck a positive result and look forward to the coming Rallyesprint.eu at Storndorf. “After we lost already our chances for the Masters-champion in the Saarland, our plan was to operate a little bit more reserved at the 3-Städte-Rallye. Our aim was to reach the finish within evaluation and to make sure a place within top 10 in the ADAC Rallye Masters. Before afternoon we rejected the original tactics. My copilot Tanja Neidhöfer and I decided to increase speed and so also driving pleasure. From now on our droven times were within the top 6 and we came closer to the top. Finally we finished the ADAC 3-Städte-Rallye on overall-rank 8 and reached, from 200 competitors within the ADAC Rallye Masters, the seventh rank in the mastership. This placement is much more better than we thought before start of season. Before the last two runs we laid on rank 2 in the championship with a good chance to become the champion, however, it wasn’t meant to be. I’m glad with Nils Heitmann (Hamburg) who finished with his small VW Polo a fantastic season and has earned therefor this title really”, Thomas Wallenwein appears as a fair sportsman. The ADAC Saar-Pfalz rally on 08th/09th of October 2010, around the Saarland city of St. Wendel, was the first of two final runs within the ADAC Rallye Masters. 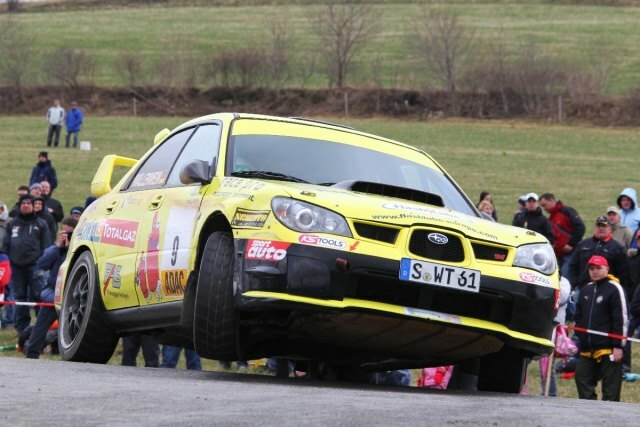 Till halftime the yellow LPG Subaru Impreza with Thomas Wallenwein and Tanja Neidhöfer was on road to success. A defective driveshaft stopped the quick journey. Later on it was decided to finish the rally earlier due to safety reasons. “The special stages of the ADAC Saar-Pfalz Rallye are the best what I have driven in this season. These stages are as interesting as in Italy”, Thomas Wallenwein already swarmed after the recce on Friday afternoon. The rally begun with a showstart on Friday evening on the “Schloßplatz” of St. Wendel. After that, two special stages in the darkness stood on the programme. Almost all competitors had her problems here, also Stuttgarts team Wallenwein Rallye Sport in the Tyczka Totalgaz Impreza remained not spared: “First we went in the dust of a competitor, later we missed a junction and we found ourselves in a deep field. So we lost valuable time which motivated us to a more aggressive driving manner the next morning. Thus we could drive up ourselves on the special stages three to five from rank 13 to rank 7. With the attempt to shorten the distance to the top, we damaged on a bump in the road our driveshaft. With “three wheel drive” we dragged ourselves to the service park. Our mechanics did a very good job and repaired the damage within the given servicetime. On the way to the next special stage we noted a secondary damage. The wheel bearing split in the hub and it was to much danger to lose the wheel. With the look on “Safety first” we finished the rally at this time, even when it hurts deeply…” reported the Stuttgart rally pro after the first failure in the running season. „This is very irritating, however, thus is simply the motor sport. Unfortunately, the failure happened at the most unfavorable time. With the finals to the ADAC Rallye Masters there is the double score, therefore we have lost all mastery chances. But still we are glad to start at the final run in two weeks at the “ADAC 3-Städte-Rallye” (22nd/23rd of October) in the Bavarian bath triangle. This rally is one of the classics in Germany rally sport and promises to become a real rally party. Already a big international field of participants has announced itself. The area of the “Haslinger Hof” is known for his great ambience. Already on the Friday evening there is the infamous driver's evening near which there are substantial Bavarian specialities and on Saturday evening there is as usual a sensational winner's honour“, copilot Tanya Neidhöfer grants a view. Once more after a perfect and steady ride with the Tyczka Totalgaz Subaru Impreza Thomas Wallenwein and Tanja Neidhöfer confirmed the second place within the ADAC Rallye Masters. On the 11.09.2010 the Ostsee-Rallye (Baltic Sea rally) was the last pre-run within the hard fightet competition. While some competitiors had to fight with problems the team from Wallenwein Rallye Sport showed his class and collected diligentliy points for the championship. “This rally is a real highlight within the calendar of the ADAC Rallye Masters. We all liked the ambience within the holiday ressort “Weissenhäuser Strand” very well. The special stages surprised in a very positive way: many curves, forests, crests and gravel parts, everything what rally puts out exists here! We didn’t expect that in the north of Germany. Furthermore a lot of visitors showed their interest on rallysport and standed along the special stages. Particularly the unique atmosphere on the circuit stage in the port of Neustadt was to be emphasised. Pure driving I liked the stages on the military training area “Putlos” best of all. But due to missing knowledge of these stages I lost a lot of time to the competitors. I have been here 30 years before but at this time there was not only one kilometer on tarmac. With the second rank behind Klaus Osterhaus within our division we are very contented. In the final ranking we had no chance against the strong and lightweight BMW M3. But at least the sixth overall rank is not bad at all.”, summed up Thomas Wallenwein contently in the evening. “The only criticism points are smaller defects within the organisation. The organizers were reasonable and promised improvements in the future. We tackle the 800 kilometer long journey then absolutly with pleasure again” continued the rally pro of Stuttgart. 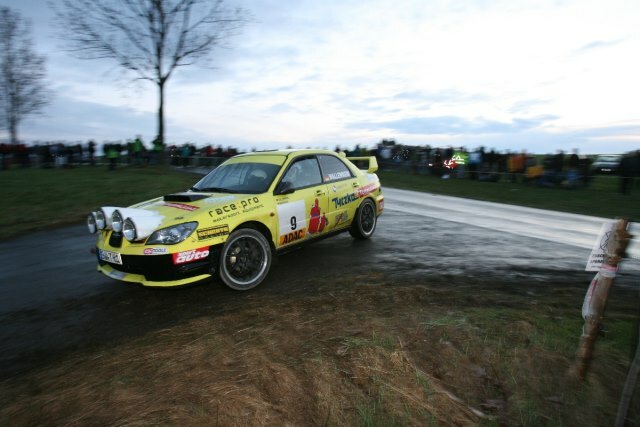 In the championship the LPG powered yellow Subaru maintains furthermore the second overall rank. Still on top is Nils Heitmann (Hamburg) with his VW Polo. On rank three follows the present champion Carsten Alexy with his Audi. In October the two finals in the Saarland as well as in Bavaria are on the programm. Here is the matter of running the double score, what promises absolute great suspense with the scanty distance between the competitiors. „We are very content with the present season. It’s fantastic to present low priced rallysport on a very high level. 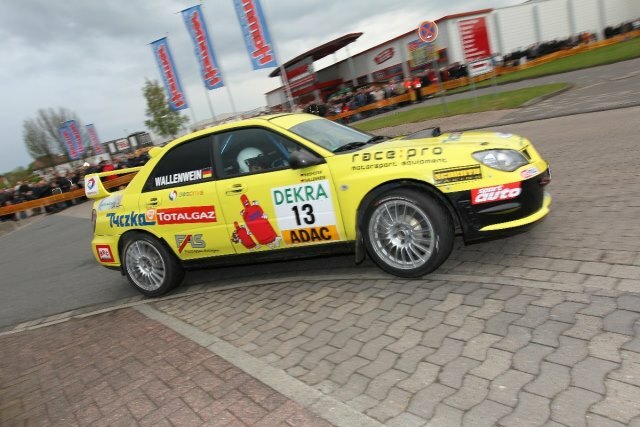 During the beginning years we performed a lot of developing work to the alternative fuel LPG in rallysport. Our strains have been worthwile with the results of the last two years anyway.” Jürgen Farkas took a short interim balance on the Baltic Sea. On 23./24. July the ADAC Rallye Baden-Württemberg took place on the Swabian Alps around the town Laichingen. Only a few kilometers before the gates of Stuttgart the 6th competition of the ADAC Rallye Masters was a home match for the LPG powered yellow Subaru Impreza. Once more Wallenwein Rallye Sport in cooperation with Tyczka Totalgaz Rallye Team proved the competition ability and reliability of this alternative fuel. The rally presented itself as changeable as the weather conditions. From heavy rain to sunshine, everything was present. Thomas Wallenwein and copilot Fred Winkelhofer (Pocking) felt very comfortable on the first stages: "There was so much water on the stages and there have been many possibilities to place the rally-car besides the track. We felt very well with this difficult weather-conditions and have been within the top 5 in the overall-ranking. At halftime we heard some sound from the rear-axle and decided for a change in the service-break. Unfortunatelly the change was not possible within the given 20 minutes time, so that at least we get a 1 minute penalty. This threw us back several positions, but however, we remained in the rally", summed up the teamboss in the evening. The direct competitiors met it by far more badly. Beside the hanseatic Nils Heitmann, the last years champion Carsten Alexy, also had to park his rally-car after a technical defect prematurely. So at least the ninth overall rank was enough for Thomas Wallenwein to get back on 2nd place in the schedule of the ADAC Rallye Masters. „The mastery develops very full of suspense. Between place 1 and 3 lie just 10 points, there everything is still open. We are very contented with our result. To tell the truth, at the beginning of the season we had not expected to be in the state to fight for the championship." is Wallenwein glad, and this in spite of the missed chance to takeover the leadership. With Wolfgang Günther and Susanne Heiler-Kling another Subaru Impreza from Wallenwein Rallye Sport finished the rally on 6th rank. Winner of the rally was Hermann Gaßner in front of Rainer Noller, both on Mitsubishi Lancer. The ADAC Rallye Baden-Württemberg presented itself with a very good organisation. A few small weakness have been in timetaking on the stages as well the timings within the roadbooks. Further the number of circuit-stages was to much. Otherwise the sign-posting and the service-area offered already world-championship status in many interests. "This was a great home match! Without the problem on the rear-axle, a place under the top 5 would have been possible again. We are very glad that we are able to adduce with sporty evidence that LPG works, beside his daily suitability, also easily under hardest conditions in motor sports. Furthermore we help in development and are firmly convinced that at least the efficiency is not reached. And with every rally we save also hundreds of Euro on costs for fuel", is the conclusion of Walter and Jürgen Farkas after the rally. On 11. September the next event within the ADAC Rallye Masters is the "ADAC Ostsee Rallye". The rally headquarter finds it place on the holiday's area "Weissenhäuser Strand". Legendary stages like on the training area of the Germany Army "Putlos" or the circuit at the port of Neustadt are part of this rally. We look forward to the rally on top of Germany …. During the fifth run to the ADAC Rallye Masters the LPG powered Subaru Impreza could prove his potential under African heat of more than 35 degrees Cels. With the second rank in their division Thomas Wallenwein and Tanja Neidhöfer strengthen the third rank in the mastership. „This was a very strenuous rally. The scorching heat made it especially difficult to all participants. At least we reached our aim and we were able to collect again important points for the championship. At the end we were faced with two small problems, without them more would have been possible. On the one hand our cars rear break out sometimes which was caused to a problem with the breaks. Later we deplored a drive shaft damage which our crew could repair fast during the servicebreak. The rally itself was well organised as well the serviceground was good and offered lot of space. The special stages presented themselves mostly demanding. Only I did not like the once to drive circuit at midday with its many full power passages. We’re still on a podium rank within the championship and so we are full within our planned target. We all liked the ambience on the edge of the Harz mountains and I can recommend the Harz cheese, tht’s really tasty” Is Thomas Wallenweins positive conclusion to the last weekend. “Very nice for our machanics was that they presented the football matches of the world-championship on a large-format-screen next to our service-area. As we finished the rally the match Argentina vs. Germany was over, but at least our team won this football-game also without our support. Very comfortable I found the several showers which have been installed all over the serviceplace. Drivers and mechanics were glad about this small cooling equally. I cannot understand the small complaint of sides of the rally leader with regard to not quite kept departure times completely. If the paperwork would not take waiting time with more than 1 hour, every participant would finish the recce within the given time. So it was a little bit tight for all, but at least I liked this event”, Tanja Neidhöfer says. Highly summer temperatures welcomes us in the federal state of Saarland to the third run in the ADAC Rallye Masters. The ADAC Rallye Litermont fascinated by a good organisation, with demanding special stages and a compact distance guidance. Thomas Wallenwein and Tanja Neidhöfer drove in the bang-yellow Subaru Impreza of Wallenwein Rallye Sport in cooperation with the Tyczka Totalgaz Rallye Team on rank four in the overall ranking. With this result the team climbs up again in the championship. „14 special stages with close to 130 kilometres and all that within only 8 hours, this was a really demanding rally! Here a big praise to the organisation, everything has functioned very well and the staff was completely friendly and helpful. I liked the special stages very well, even if they were partially very fast. There were many courage passages were you had to grit your teeth and get over. Just on the gravel segments we had really big fun, because they were not brutally for material and you can could nicely let go the car. We began first of all a little bit cautiously and increased successive ones. In the final phase we attacked, because we absolutely wanted to reach the fourth place what we should also manage in the end. After we made top time in SS 10 we had several fright seconds on the next stage. We cut a curve a little bit too much and the car positioned itself on 2 wheels. After several metres we landed again on all 4 wheels. This could also have gone out differently. Close to 19.oo hrs we reached the finish line on the “Schloßplatz” of the city of Saarwellingen and we were received cordially. A special flair offered the open-air winners ceremony. The weather was great too, with not only one small cloud on the blue sky. It was a pretty nice rally …”Thomas Wallenwein swarmed in the highest tones. „Thomas and Tanja presented themselve in top form and made not only one smal scratch within the rallyecar. Only routinework like filling up LPG and change tires were to be made in the service-breaks. It feels very good when you take a look on the times and you can find out that it’s possible to make top times with the alternative fuel LPG. We are very contented and tensely brings what the remaining season”, Jürgen Farkas concluded positive at the end. The next competition to the ADAC Rallye Masters is the coming rally „Stemweder Berg“ in two weeks. The headquarter of the rally is in the town of Stemwede-Levern. Also here the LPG Subaru will hunting for top times on this event. Highly motivated started Thomas Wallenwein and Tanja Neidhöfer into this event. Just the difficult "IVG area" which leads on narrow forest ways by a former military depot had done it to them: „This is actually demanding. One curve follows the next, there the teamwork is particularly important between driver and copilot. Only the smallest mistake can end beside the track. Who thinks that it goes in the north only straight ahead, that was not yet on this area …“, the Stuttgart’s says with a smile after the first stages. Traditionally the spectator's circuit in the industrial area of Sulingen took place at the evening. Once more thousands of spectators fired the record-breaking starter field of more than 120 participants. „ADAC Mobil Pegasus Rallye Sulinger Land“ has made a good name to itself during the last years with the neighbouring Dutchmen and annually follow more and more this call. Also some competitors from Scandinavian countries are true guests at this event. Close to 20.oo hrs the duet crossed after apprx. 12 hrs in the rallycar the finish line next to the spectators circuit and were happy to be on rank 6 in the overall result. With this good result they made a junp from rank 10 to rank 6 within the ADAC Rallye Masters. „Unfort. We must drive our car with a 32 mm airrestrictor while our competitors are allowed to start with one milimeter more. So we lose a lot of time on long straight line. But we were able to show on the selective stages at morning as well on the final spectators circuit that we are able to drive with LPG within the top 5! The whole team of Tyczka Totalgaz and Wallenwein Rallye Sport enjoyed this rally and the beautiful region. And of course we have also tried from the tasty asparagus … “, Thomas Wallenwein struck a completely positive balance. Rally sport at a highest level was offered on 11 special stages around the 47th ADMV Rallye Erzgebirge (10./11 April 2010) with start and finish in saxonian Stollberg. Changing weatherconditions strenghtened the driving claim by a multiple, so that really nor boredom arose on the 110 km which have to be completed on best time. Thomas Wallenwein and Tanja Neidhöfer showed a consistently good achievement on the Subaru Impreza pursued with LPG and protected to themselves important points in the ADAC Rallye Masters, the second national league in German rally sport. “The car was running like a clockwork and we were able to grow steadily. We are very satisfied with the second place in our class and the seventh place in the overall ranking. So we are within the top 10 in the championship. We did not take to much risk but even we did also not only a ‘walk in the park’” jokes Stuttgarts Thomas Wallenwein after the successful season opening. “We will carry out some small changes on the car and we are sure to find some better performance on the car. Our team is high motivated and everybody has big fun, there still goes something on .. “ says Wallenwein. „With this result we could prove once again the competition ability of our LPG powered rally car. When you take a look on present price development at filling stations, in my opinion, much more attention should be laid on this favorable variation of motor sports. LPG is clearly a big step to reduce the application costs,” advises Walter Farkas, who is successful on motorsports with this alternative fuel since now about 10 years. Finally the 2010 season of the ADAC Rally Masters starts on coming weekend (10./11. April) with the ADMV Rally Erzgebirge in the new season. Due to problems with needed permissions the ADAC/PRS Havellandrallye was cancelled with short notice. So at least the mastership counts nine competitions spread over the whole Federal Republic of Germany. Thomas Wallenwein (Stuttgart) and his copilot Tanja Neidhöfer (Elz) looking forward to be on start of this rally: “The winterbreak was even longer than we planned originally. We are very glad that the season begins now also for us. Till yet I only have been on the service area when my sons Sandro and Mark startet at this rally. So I do not know the stages in detail. There should be some very fast passages along tree avenues and in addition on Saturday evening it’s driven in the dusk. Our target is to reach the finish, take no unnecessary risk and collect some points for the ADAC Rally Masters. Rallysport has a long tradition in the Erzgebirge and a lot of spectators will be along the special stages to push the teams. That’s what brings a lot of fun to drive a rally”, the teamboss looks forward. Start of the Rally Erzgebirge is at Saturday afternoon at 17.oo hrs at the “Kulturbahnhof” in Stollberg. The special stage „Oberdorf“ must be completed 2 times, in between the classic stage “Grünhain” is on the programme. „Particularly we are glad about this stage! Our new sponsor “Gasflaschenwerk Grünhain GmbH” is located next to the stage, so that there we will exert specially” says Thomas Wallenwein. The Sunday begins at 07.o5 hrs at morning and additional 8 special stages have to be completed. The overall winner is celebrated at the finish line at 16.o5 hrs in Stollberg. “Together with Wallenwein Rally Sport it’s the first time at the Rally Erzgebirge that a 100% pure rallycar is powered with alternative fuel LPG. After nearly 10 years of experience with LPG in rallysport, we are confident that the LPG equipment will work in this car also absolutly reliable”, Jürgen Farkas says optimistic.